We’ve seen the attack ads and the gubernatorial debates, but do we really know any more about who the democratic candidates for governor are as people? In our two-part series, “The Race for Illinois Governor 2018,” Chicago Tonight attempts to answer biographical questions about these candidates to give voters a sense of their leadership styles, experience and backgrounds. In Part 2, an in-depth look at Gov. Bruce Rauner, a Chicago-born father of six whose childhood was shaped by his mother’s mental illness and a close relationship with his grandfather. As a result, Diana Rauner said, her husband spent his youth protecting his siblings; as a child, his maternal grandfather, Clarence Erickson, was his “best friend” and instilled the value of hard work – Rauner was valedictorian of his ’74 high school class in Scottsdale, Arizona. As an adult, the self-professed member of the .01 percent used his natural intelligence and assiduousness to build a fortune in private equity as managing director for GTCR (previously Golder Thoma Cressey Rauner) before going on to funnel his wealth into causes near and dear to him: his alma mater Dartmouth, education, and ultimately, funding a campaign for governor with a goal to “shake up” state government. Backers and detractors alike will agree that Rauner accomplished that much. He was inaugurated as Illinois’ 42nd governor on Jan. 12, 2015. During his tenure, partisan strife and a standoff with Illinois House Speaker Michael Madigan led the state into a budget impasse that dragged on for two years, causing the state’s credit rating to crumble, the backlog of bills to skyrocket and leaving a beleaguered social service network and higher education system in the wake. Backers credit Rauner’s forceful, stubborn nature for trying to make good on his vision for improving Illinois’ economy, while detractors ascribe the deadlock to his arrogance and political ignorance. Those close to Rauner describe a longtime commitment to social causes, like nature preservation and education, but BMO Harris Bank CEO Dave Casper – Rauner’s Dartmouth roommate and best man in his wedding (Rauner likewise was best man in Casper’s) – said he was nonetheless surprised when Rauner ran for governor, his first elected office, in 2014. Rauner was elected four years ago on the promise of change, driven home by a phalanx of campaign commercials that showed off his $18 Timex watch, wardrobe of flannel shirts and an old Volkswagen bus, but neighbors and relatives say it wasn’t false advertising. Rauner, they say, is “cheap” and the family of eight would often cram into the VW van to take road trips. 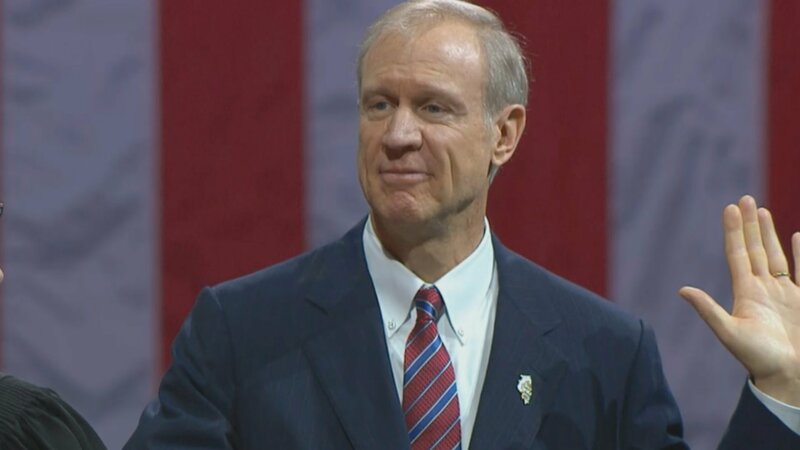 “Bruce came into office wanting to make some major change … to try to save our state,” Diana Rauner said. While initially Rauner had Republican lawmakers in lockstep, there was ultimately a split after he signed a law to expand taxpayer-subsidized abortions. Rauner narrowly edged out Wheaton state Rep. Jeanne Ives in the 2018 primary election. In September, Rauner “humbly” asked voters for “another four years to finish the job we started” and that while he hasn’t lost his “courage” he “underestimated how difficult change can be in government” – a stark change in tone for a man known for his aggressive, even ruthless, approach. Voters will decide Nov. 6 whether to give Rauner that chance, or whether they’ll hand the reins to Democrat J.B. Priztker, another wealthy businessman with roots in philanthropy and venture capital. Note: This documentary first aired on “Chicago Tonight” on Oct. 18, 2018.